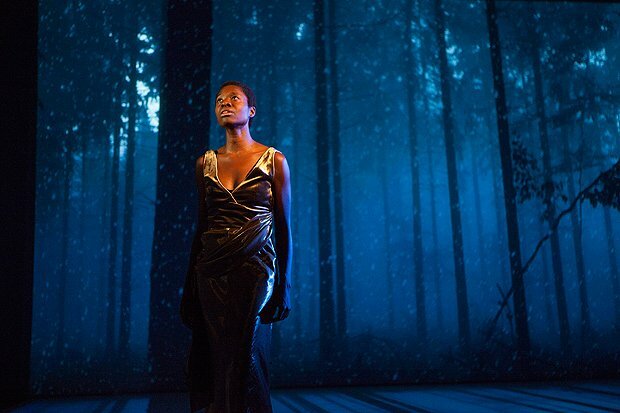 Classically-trained soprano Neema Bickersteth is a wholly compelling performer, despite not uttering a single word during Canadian company Volcano's multimedia performance work, Century Song. Alongside pianist Gregory Oh, and percussionist and computer effects technician Benjamin Grossman, she presents a one-woman show that fuses art forms to interrogate 100 years of the black North American female experience. Century Song is multidimensional in its creation, with Bickersteth's wordless singing of classical songs and improvised instrumental music providing an affecting soundtrack to the visually stunning projections and tenacious choreography on show. The music and visual art used throughout is bold, supplying an ideal backdrop to the lush vocal arrangements. Beginning with Rachmaninoff's Vocalise, Century Song takes audiences on a stirring journey that includes music by Messiaen, Cage and award-winning composer Reza Jacobs. As well as classical music, there's also a comical medley of classic TV theme songs, as played by Oh and Grossman during an interlude that accompanies fettFilm's video The Hallway of Progress. In each time period and piece of music, the experimental nature of Bickersteth's melisma and the matching musique concrete creates the kind of theatre that doubles as art through the interconnectedness of its many different and equally arresting elements. With collaborators Ross Manson (direction) and Kate Alton (choreography), Bickersteth provides an insight into the unspoken history of black women, from slavery to protest. The lack of a set storyline accentuates the theatricality of each period depicted, while placing a focus on an unconventional exploration of changing realities. ZOO Southside, until 18 Aug (not 8, 15), 3pm, £12–£14 (£10–£12).